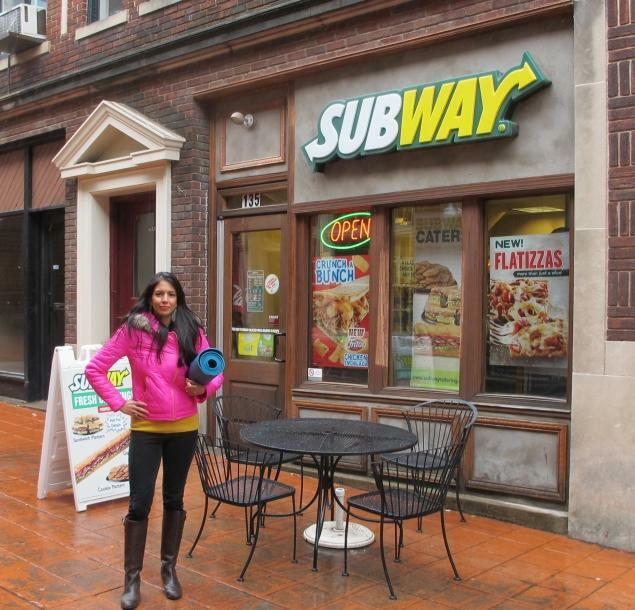 Subway is the single largest chain restaurant in the world. That means you’ve probably eaten there at some point in your lifetime and if you are like me could possibly have 10 of these restaurants within a 1 mile radius of your house. But is eating at America’s favorite fast food chain really eating real food? Subway would certainly like you to think so. With their slogan “Eat Fresh,” marketing with avocados and a guy who lost hundreds of pounds eating their famous sub sandwiches, it’s easy to get duped. You may also feel tricked when you see a little heart logo, indicating a menu item at Subway is “heart healthy.” Just last week it was announced that the American Heart Association (AHA) has endorsed several menu items at Subway and added the heart logo to indicate which ones. At every Subway on the “sneeze guard” glass they display one version of their nutritional information – the infamous “6 grams of fat or less” menu. This menu includes calories, fat grams, and that new little heart logo, but doesn’t display anything about the ingredients. Doubting that Subway or the AHA would actually ever create a real food information guide for you, I decided it was time to do this myself. Below are the “6 grams or less” menu items and critical real food information you should know about each choice.